Recently I had the opportunity to attend the Military Residential Specialist Program and I learned some very interesting things all agents should know in learning how to better assist our veterans. I must admit, even though several members of our family served in the military, I didn’t have a full understanding of the needs of veterans because I personally didn’t lead that life. This class has helped shed a light on some of those things. I’ll share a few facts many people may not know. When someone is active duty military, they tend to get moved around quite a bit. Each member must find housing. Some rent, some buy. They get orders for periods of time, but you can just imagine how up in the air their life is. Many have a family behind they care about deeply, so housing is important. Because they never really know where they’ll be for great periods of time, making housing decisions can be difficult. If they buy today, they may need to sell in 2 years. What if the market declines due to base cutbacks or other economic factors in a community? We don’t pay them a lot for their service, and they may not be able to afford the loss. Many around here in SW Florida understand what it’s like to be stuck with a property that isn’t worth what you paid or what you owe. People don’t realize that if a veteran or active duty military is foreclosed upon, or does a short sale, they lose their military benefits forever. That’s a pretty steep price to pay. Remember, we, the United States, are the ones moving them around. They don’t have a say, and yet they suffer all the consequences. Here’s another scenario. Let’s say a doctor, lawyer, pharmacist; anybody really is now in the Reserves. A Reservist can get called up for duty, just like many were for the Iraq wars. When you get called up you leave behind the pay you were making and only get the pay the military pays you. People tend to live a lifestyle depending on their job, so if you’re a doctor making a certain amount, and all of a sudden you get called up your pay may be cut 50% or more. Your bills don’t go down 50%, they remain the same. People need to understand the burden placed upon our military. Not only do the serve our country, but they risk their life, and do so many times for less money than they could make back home. Unemployment is 7% higher for veterans returning home than it is for the general population, and we all know unemployment is too high anyway. The largest employer of veterans is the postal service. What is the number one thing our government is trying to cut right now? You got it. In addition to cutting the military, we’re cutting the postal service. Somehow we’ve got to do a better job protecting our vets. As a real estate professional, we need to encourage a vet to use their benefits. Several agents shudder when they see a buyer come in with an offer with VA financing. Actually, VA loans are easy to do if you know what you’re doing. An offer with a VA loan shouldn’t be looked down upon; it should be treated equally with other financed offers. I understand cash is king and the seller only cares about their own sale, I just think we can portray these offers in a more positive light. 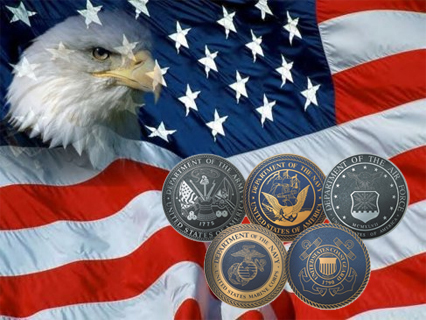 SW Florida has in excess of 250,000 veterans living among us. Veterans are 9.5% of Florida’s population. They served our country well. The freedoms we have today can be directly linked to their efforts. Some of our military were spit upon when they returned. The public has turned off on them in the past, and will in the future. They may not be a cash buyer. They have certain needs other buyers may not have. Let’s at least try to give them a level playing ground and an opportunity to enjoy the good life SW Florida has to offer. They’ve earned it. The past two weeks we’ve written Top Tips of Selling Your Home and Buying a Home. This week we thought we’d focus on where the market is headed as so many have asked for an update on the market. Prices in 2011 were up all year since February and never looked back. Most buyers realized the bottom of our market was back in 2009 at the height of the foreclosure crisis. Inventory has fallen dramatically although it has risen again which is a surprise to many. 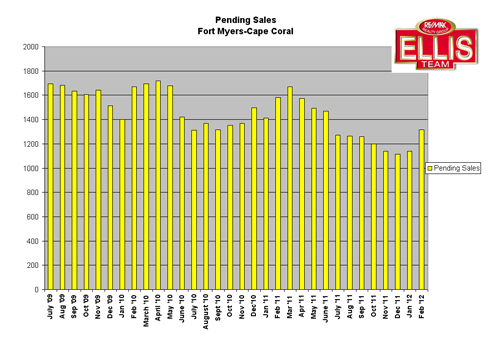 Attached is the pending sales chart. As you can see, pending sales are up 15.44% over the previous month. Looking back, February always sees a jump in pending sales as the Northern Snowbirds are here in mass every year when our weather is beautiful and it’s cold up North. This year, we started noticing seasonal visitors back in October which was an early start. While the pending sales chart doesn’t show it, people have been here looking for months. We believe they realize Florida is still relatively inexpensive compared to 2005 levels, but prices are rising and nobody wants to miss out on a good deal. Unfortunately, we have less inventory to sell, so not all are leaving with a deal. In fact, several commented they wished they would have bought last year as prices are definitely higher and selection is definitely less. We still get calls from buyers looking for $25,000 properties 3 blocks from the beach. We’re not quite sure which website they’re looking at. The only thing we can guess is maybe it’s a 2008 or 2009 version that hasn’t been updated. Maybe they’re reading old headlines, or headlines about falling prices up North. Whatever the case, they’re convinced our agents are holding out on them and they move on to call other agents who they think will have those old deals for them. The reality is the market moved on. The market rarely stays in one place, it is always in flux. 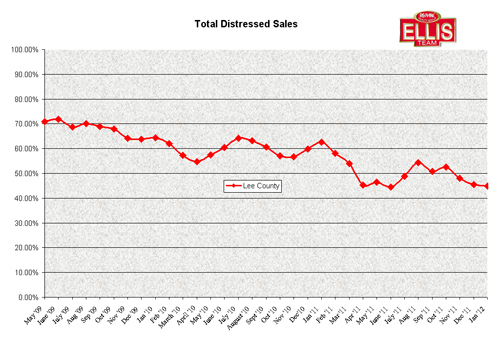 Look at the Lee County Total Distressed Sales Chart. Last month only 44.84% of all single family home sales in Lee County were distressed compared to 71.86% back in June 2009. We have seen a rise in traditional sales combined with a fall in foreclosures available to sell which has contributed to higher prices. We’ve actually seen more homes being built because of higher price points, declining inventory, and builders have been able to cut costs from suppliers and workers looking for work. While building activity has increased, it’s still a far cry from where it was back in the prime of the market. We’ve got dozens more charts we could share but only so many would fit in a one page article. Suffice it to say that SW Florida is looking up a bit in housing. Our economy seems to be doing mildly better as well, which we ultimately need to fuel and sustain any housing run-up. We know more foreclosures are on the way, but nothing like what we saw back in 2009. We have a slight backlog due to legal slowdowns because of the robo-signing issue. The market is easily absorbing all new foreclosures we bring to market and in fact has a thirst for more. We don’t believe this thirst will be quenched. We believe this year will produce a good season and hopefully things will continue on. This is an election year, and the unknowns are always tax laws, gas prices, instability overseas, and the future of our economy. Absent the wild cards, our market looks in good shape and is healing in a positive way. This healing may be slow for some sellers, and fast for some of those buyers looking at outdated headlines or websites, however it is occurring at a healthy and sustainable pace. It is a process that had to occur, and thank God it is occurring. Whether you’re buying or selling, it pays to get the facts. A mistake will cost you. Each neighborhood can be different, so be careful about relying on countywide information. It may or may not apply to the home you’re considering buying or selling. 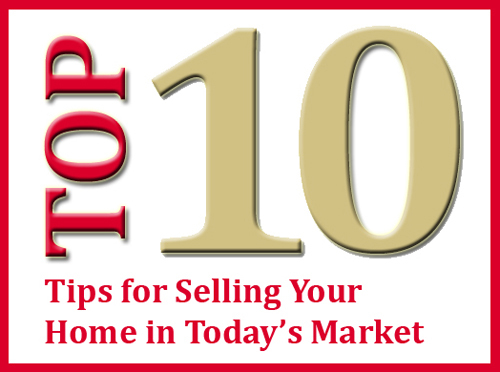 Last week’s tips on selling a home was such a hit we decided to write an article on home buying tips to help buyers. Escrow Deposit– Putting a larger escrow deposit down shows you’re serious. This is a helpful technique when competing against other buyers. It usually amazes a seller when a cash buyer won’t put much in escrow. If they won’t put it in escrow, will they ever come through at closing? There is no substitute for working with a good Realtor. Full time Realtors not only know the area, they also assist you with many of the pitfalls you may encounter. If you need assistance, feel free to call our office at 239-489-4042 and ask for a buyer specialist. Yesterday another agent called me wondering why his 3 listings in Lehigh Acres weren’t selling. After offering some tips to help out, I thought an article on the subject might help others as well. De-Clutter Inside– If a room has too many things in it, it make the room look smaller. Additionally, buyers have a harder time envisioning their personals in your home when all they see is stuff. Take out as much as you can. Marketing– Times have changed. Some agents employ the 3 P’s. Put a sign up in front yard, place it in MLS, and pray someone else sells it. Successful agents today rely on newspaper advertising, radio, TV, social media like Twitter, Linked In, Facebook Fan pages, YouTube, virtual tours, as well as mobile technology and much more. Ask to see how your home will be marketed and which national sites it will be syndicated to when interviewing agents. If You Owe More Than Home is Worth, Select a CDPE-44% of homeowners in Florida are underwater on their mortgages. It takes a certain expertise to work with the banks on short sales. Buyers and sellers need lots of education attempting to close a short sale. A Certified Distressed Property Expert can help.